After denying responsibility for dozens of Jeep fire deaths, Chrysler finally issued a limited Jeep fire recall. But it’s not enough -- not when innocent Americans keep dying due to exploding Jeep gas tanks in post-collision fuel-fed fires. Such fires happen in Jeeps because of inherent design and manufacturing flaws. Unaccountably, Chrysler designed many Jeep models in much the same way as the notoriously disgraced Ford Pinto of the 1970s, placing a plastic gas tank behind the rear axle and underneath the vehicle’s rear bumper. Since the Jeep is a high-riding vehicle, when a lower vehicle’s bumper strikes it from the rear, the Jeep’s plastic gas tank can rupture. Then spilled fuel can ignite via a single spark, either from friction of the impact or from electrical elements in the vehicle. After such a Jeep gas tank exploding, victims may be trapped within the vehicle and can be horribly burned if not killed. As for those recalled Jeeps, they number 1.56 million, although the National Highway Traffic Safety Administration asked Chrysler to recall an additional one million, and Chrysler refused. 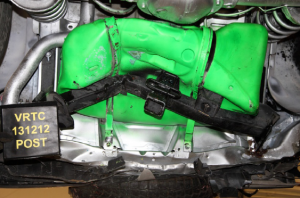 The Jeep fuel tank recalls are for older models. From model years 2002-2007, Jeep Liberty SUVs were recalled. From model years 1993-2004, Jeep Cherokee SUVs were recalled. Chrysler did not recall one million Jeep Grand Cherokee SUVs made between 1999 and 2004, despite the NHTSA’s concerns about a Jeep gas/fuel tank exploding. Chrysler issued these Jeep recalls in 2013 -- three years after federal safety experts proclaimed their concerns. Meanwhile, Americans continued to die in Jeep fires. Recalls are made in order to fix vehicles’ defects. What have been Chrysler’s repairs after Jeep gas tank recalls? It turns out, very little has been done to fix the vehicles. Chrysler’s first plan was simply to place a trailer hitch on the rear of recalled Jeeps in order to provide more protection in rear-end collisions. Yet Chrysler did not bother doing any testing to determine if such a thing would prevent a Jeep fire from erupting in a rear-end wreck. So a trailer hitch may or may not help. Would you put your life on the line with such a question in the air? Not only that, but Chrysler has been agonizingly slow to make Jeep repairs of any kind since issuing its Jeep recalls. According to safety regulators within the federal government, Chrysler will take another five years to make repairs on all Jeeps by adding trailer hitches at the slow rate it’s going. That hasn’t kept Jeep Cherokee fires or Jeep Liberty fires from happening -- not to mention Jeep Grand Cherokee rear-end collision fires. Jeep recalls and repairs also haven’t kept Americans from asserting their legal rights by filing Jeep fire lawsuits against the automaker. Too, the U.S. government is revisiting its earlier investigation into Jeep fire deaths as of April, 2015. Meanwhile, the first major Jeep fire lawsuit has been completed -- and in a big way. The family of a 4-year-old Georgia boy who died while riding in a 1999 Jeep Grand Cherokee was awarded $150 million by a jury. At least 70 other Americans have died in Jeep fire accidents, and more may die in ensuing years. Chrysler has modified more recent Jeeps to add a metal shield or skid plate to protect gas tanks, as safety experts had advised. Chrysler also moved gas tanks from behind the rear axle to in front of the rear axle. But older Jeeps without such protection remain on the roads -- and not all have had a Jeep recall for repairs. Recent or future victims can find legal support from the Willis Law Firm. Whether or not your vehicle has had a Jeep fire recall, you may be legally entitled to claim payments for your losses in a Jeep fire caused by the negligence of Chrysler. Notify the Willis Law Firm today and get a free case review of your Jeep accident. We can advise you on your chances of getting payments for your medical expenses, lost wages, suffering and pain after a Jeep rear-end crash fire. You may be entitled to substantial financial recovery.